Published on 20 November 2006. This story has run and run, far more than I ever expected. But this looks like final, final closure. 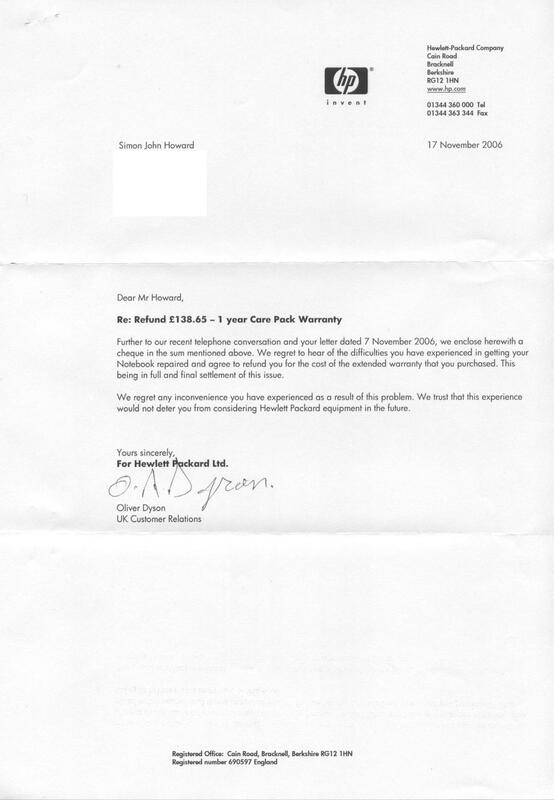 HP have agreed to refund my £138.95 Care Pack Warranty. It is clearly to their credit that they’ve seen sense in the end, admitted fault, apologised, and refunded my money. Click the letter to the right to read it in full. What more can I ask at this point? I feel that they’ve done all they can, they’ve come through in the end, and I’m more than happy. I do love stories with happy endings. This 1,000th post was filed under: HP Support Blog. Comment posted at 23:02 on 16th February 2010.
a lot of what I’ve read.